Marija Smilevska came to VIU from the University American College in Skopje, Macedonia, with whom Virginia International University (VIU) has a strong bond due to the academic collaboration between the institutions. Marija is enjoying her time at VIU, studying with diverse students, learning a new culture and languages, and exploring America through her active lifestyle with she has made at VIU. 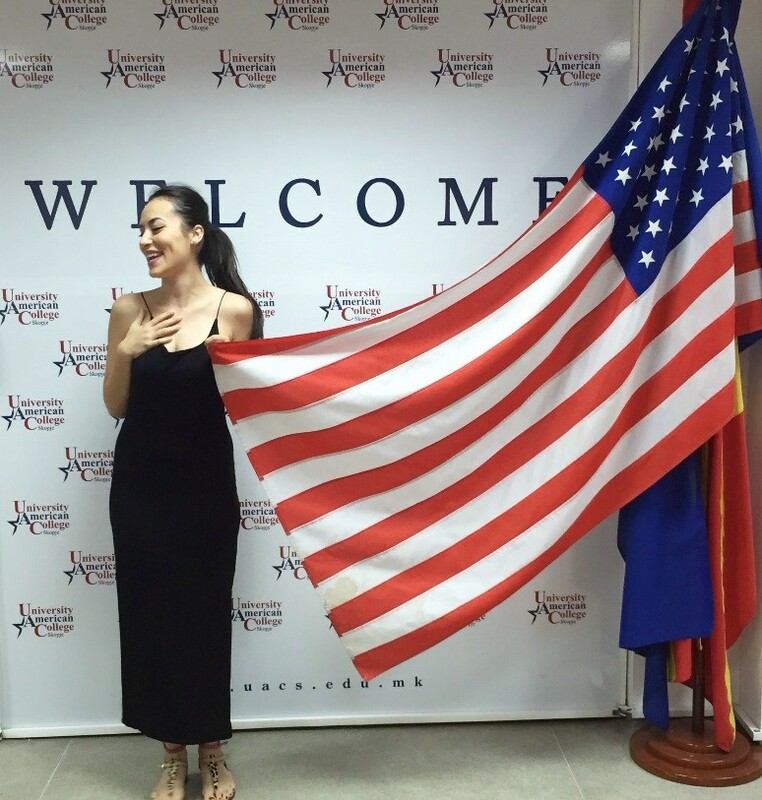 University Magazine asked Marija to share her personal experience in the United States. Her story is inspirational and informative for those students who are looking forward to studying with us at VIU. While I was studying at University American College in Macedonia for my undergraduate program, I was advised by our university’s dean to apply for this collaboration program with VIU to finish my studies in the US. My mother also supported the idea, and so here I am today. In the exchange program between my universities, I will be studying in VIU’s Bachelor of Science in Business Administration after I am done with my English program. I was super excited when I learned that I had been accepted to VIU. The idea of coming from Macedonia to Washington, DC, living in a new environment without knowing anybody, made me anxious and at the same time happy because I like challenges. I was always curious about what America was really like. I imagined America might be like those popular Hollywood movies, TV shows, and video clips. But it is completely different from the movies, something you can understand only after you’ve lived here for a while. Americans are very hard working. They also enjoy spending quality time with friends and family, and they seem to exercise a lot, running, or doing sometimes extreme sport activities, seeking adventures. There are 24/7 gym and health clubs, marathons and sport campaigns for various causes, a variety of multinational foods and vegetables at affordable prices, you name it. Yes, I am definitely in love with America for offering so many options. Of course, there are those on the other side of the story: people who eat unhealthy food, don’t exercise, and don’t love their bodies. Being healthy is a treasure. My daily routine is simple. I wake up early in the morning and breathe some fresh air, drink a big glass of water, and get breakfast with my favorite coffee. Afterwards, I get on the school shuttle to attend my classes and take part in other school activities. I prefer to run in the afternoon after my school work. Since I started studying at VIU, I can definitely tell that my English has improved a lot. Wherever I go, I must speak in English, including in the classroom. Lucky me, I have great professors who prepare us into the real world by teaching us how to communicate with others and so on. VIU gave me a great chance to explore many different cultures through the diverse community. I have found great friends who come from places I never knew existed. They make my life much easier by helping me to cope with loneliness, cultural shock, and even school stuff, and we understand each other well, so you never feel like you are foreigner or stranger next to them. A funny example is that I have always struggled when it comes to currency, especially comparing dollars and denars (Macedonia’s currency). Even for these little things, I am thankful for my friends and for everything that they do for me. One of the unique things about VIU is the friendly environment and the opportunities given to students. For instance, if your English proficiency is not high enough to study in the graduate-level programs, you may study ESL until you reach an academic English level. In the near future, I am planning to apply for a scholarship and on-campus job opportunities so I may add them in my résumé. I can’t wait to see that happen. Studying minutes away from the world’s capital, Washington, DC, makes me feel good too. As Macedonia is a European countries, the Easter holiday is the most special one to us. We celebrate a little bit differently than US. Our celebration lasts three days. We paint eggs, visit relatives, go to the church, and attend the prayers which make you feel very spiritual and pure. As I am wishing a happy new year to all University Magazine readers, I am thankful for what a beautiful life God has given me and all of us. We have to appreciate everything in this new beginning! « Issue 4: Why I Love Teaching at VIU?